Buckle up and get ready for a crazy journey with me through some of the most challenging and diverse licks I've ever produced! 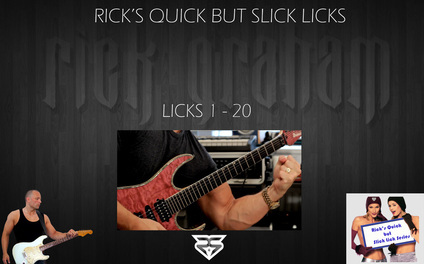 In the first part of this series, I'll show you the first 20 licks of my hugely successful 'Rick's Quick but Slick Licks' series which take you through a wide array of modern guitar techniques and styles guaranteed to take your technique to stratospheric levels! All of the original backing tracks are included in the download.